Newport, OR — On Tuesday, February 28, 2017, elementary, middle, and high school students along the Oregon coast loaded up their posters and student-built devices and headed to Oregon State University’s (OSU) Hatfield Marine Science Center to participate in the annual Oregon Coast Renewable Energy Challenge. 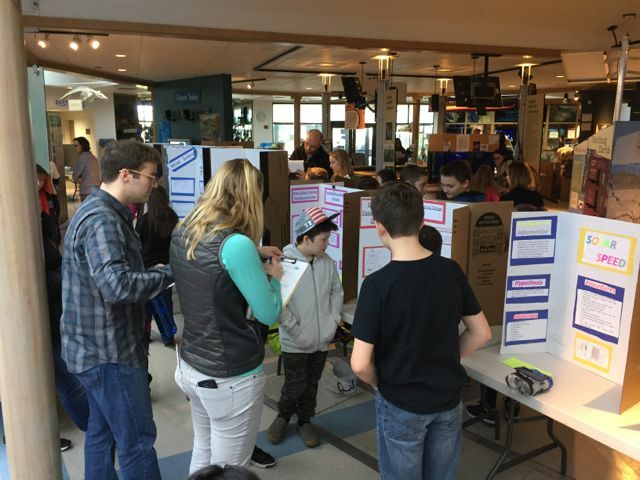 This year, 220 students from Waldport, Newport, Toledo, Lincoln City, Tillamook and Knappa participated, bringing 75 wind, wave, and solar energy devices to display, test and be evaluated by engineering judges. For weeks prior to the competition, these students researched renewable energy, learned about existing and emerging technologies, then worked in teams to design and build their own working devices. The engineering judges were quite impressed with this year’s innovative designs and the students that created them. $40 million open-water, grid-connected national wave energy testing facility. The facility will be constructed by the Northwest National Marine Renewable Energy Center at Oregon State University and will support innovations in wave energy technologies capable of harnessing wave energy resources along our coastline. Employment in the Renewable Energy sector is rapidly expanding and provides high wages jobs but requires Science, Technology, Engineering, and Math (STEM) skills. Supported by OSU, Oregon Sea Grant, the Oregon Coast STEM Hub, and Georgia-Pacific, the Oregon Coast Renewable Energy Challenge promotes the development of these STEM skills as students work in teams to research issues surrounding renewable energy, then design, construct, test, and refine their devices. Students then have the opportunity to convey to a panel of engineering judges their design process, challenges faced, and how they worked to overcome them. 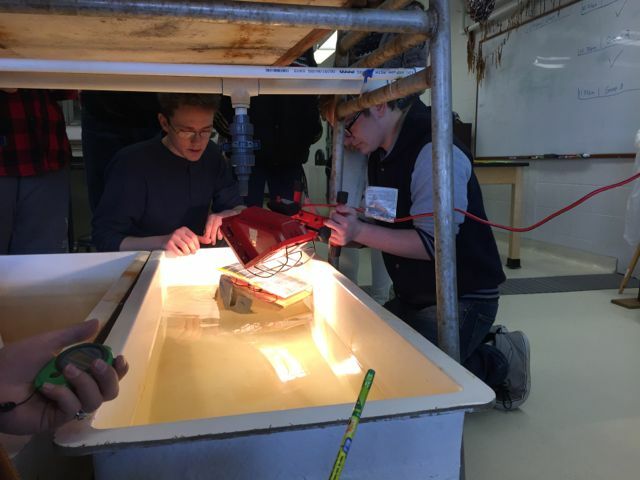 This year, twenty volunteers from OSU, Oregon Sea Grant, the National Oceanographic and Atmospheric Administration (NOAA), and Central Lincoln PUD helped to run the competition, evaluating student designs and testing devices in a large wind tunnel, wave tank, or under high wattage lights to determine power output. Winners of this year’s Oregon Coast Renewable Energy Challenge are listed below. Top wind teams from each age category are also invited to participate in the National KidWind Challenge in Anaheim, California on May 24-25, 2017. The national competition is being held in conjunction with the AWEA Windpower Conference and Exhibition, the largest gathering of wind industry professionals in the United States, where students will meet industry representatives, talk to professional engineers, and tour the trade show floor to see the latest and greatest in wind power. Based at Oregon State University’s Hatfield Marine Science Center, the Oregon Coast STEM Hub is one of eleven regional STEM Hubs funded by the Oregon Department of Education. 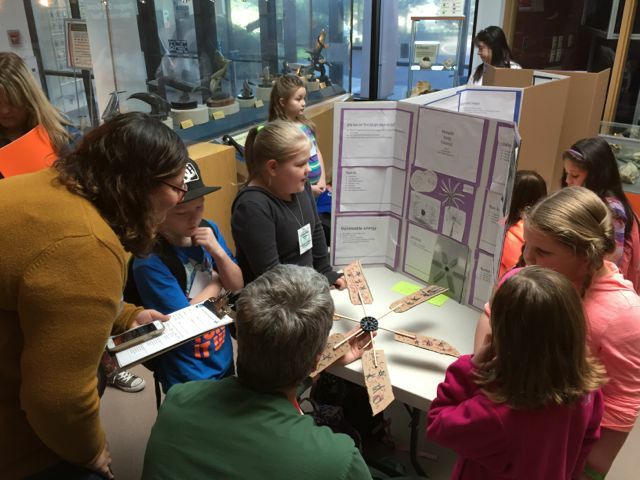 With over 58 active partners, the Oregon Coast STEM Hub serves coastal teachers, students and communities along the Oregon coast, connecting them with regional resources and providing world-class STEM experiences. For more information or to make a donation to support teams traveling to the national competition, please contact Tracy Crews at OregonCoastSTEM@oregonstate.edu. 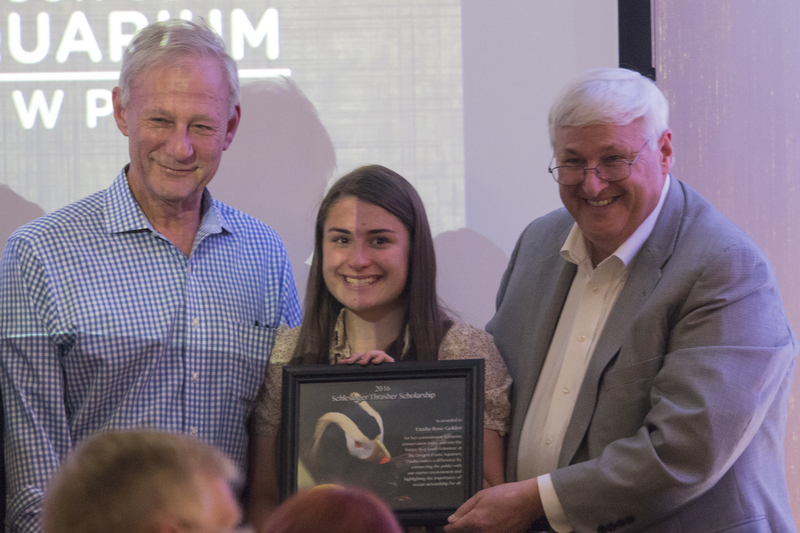 The Oregon Coast Aquarium in Newport holds its annual Ocean Steward Celebration fundraiser in Portland every spring, and this year marked the inaugural presentation of the Schlesinger-Thrasher Ocean Steward Scholarship. The $2000 scholarship is the brainchild of Ken Thrasher and Barry Schlesinger, dedicated Aquarium board members impressed and inspired by the Aquarium’s educational programs. “They saw an opportunity to link the Aquarium’s efforts with the broader educational community,” said Caryl Zenker, the Aquarium’s Vice President of Development, who organizes the event. This year’s scholarship recipient is Waldport High School senior and aquarium youth volunteer Etasha Golden. Etasha started in the aquarium’s Youth Program in 2015, volunteering more than 150 hours over the course of the summer. This year she is returning to the youth program as an interpreter as well as crew chief, a leadership role in which she mentors, guides and supervises her fellow youth volunteers. Next year Etasha is planning to attend Oregon State University and study engineering. When she entered the youth volunteer program she was unsure of which field in engineering she wanted to study, but her experiences as an Aquarium youth volunteer have helped steer her toward environmental, oceanographic and humanitarian engineering. She is particularly interested in wave energy and the use of underwater robots, and looks forward to expanding upon her passion for the ocean in college. The Schlesinger-Thrasher scholarship is tailored toward local students pursuing a college degree, particularly those involved with the Aquarium’s volunteer programs. Potential honorees are asked to describe how volunteering for the Aquarium impacted them personally, and how the experience will help further their goals. The Oregon Coast Aquarium is a partner in the Oregon Coast STEM Hub, and offers marine-focused STEM experiences for youth and adults through its exhibits, education programs, teacher resources, online Oceanscape Network, and volunteer programs. The Central Oregon Coast NOW Foundation is excited to announce that it was awarded a grant from the Siletz Tribal Charitable Fund of $1661.00 to be used by the Central Oregon Coast Chapter of the National Organization for Women (NOW) STEM (Science, Technology, Engineering & Math) Committee for its planned summer 2016 Earthquake Camp for girls. In addition to the Engineering Camp, the STEM committee also hopes to conduct a “Starry Night” astronomy camp for girls during the summer of 2016. Central Oregon Coast NOW has helped sponsor two girls robotics teams, and also the 2015 GEMS (Girls in Engineering and Marine Science) Camp. Some of the STEM committee members have served as mentors for the Newport Science Fair students, and as judges for the MATE ROV robotics competitions. As details about STEM summer camps and events becomes available they will be shared on the Oregon Coast STEM Hub website. Central Oregon Coast National Organization for Women is a partner in the Oregon Coast STEM Hub. BRANSON, Mo. – Nicholas Krissie of Sunset Middle School in Coos Bay, Oregon was awarded the STEM Champion Award during the International STEM Education Association’s STEM Expo in Branson, Mo. on October 13, 2015. The STEM Champion Awards program honors public and private elementary, middle and high school teachers and teacher educators who have served as champions for integrated science, technology, engineering and mathematics (STEM) education in their schools and communities. Nicholas created a one string guitar class during his first year of teaching. In the class, students learned math through the measurements required to build an instrument. They learned energy transfer as they studied how instruments worked. They learned engineering design, history, research methods, wood working, perseverance, and many 21st century skills as they built their instruments. One of the most important lessons they learned was that math, science, and other school subjects can be applied in real life. Upon realizing the success of Nick’s instrument program, the Coos Art Museum and the Coos Bay Community Education Foundation provided grant funding to extend the instrument program to include the entire fifth grade. The implementing the one string guitar class and creating integrated STEM curriculum lead to Nick being asked to serve as a STEM mentor teacher for the school district. Nick continues to grow as an educator, and he has been asked from organizations world-wide about how to implement a guitar program. 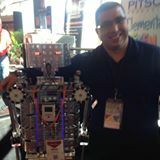 We commend Nick for demonstrating to students how what they learn in school can be translated into real-world skills. The STEM Champion Awards serve as a standard of excellence for individuals who promote integrated science, technology, engineering and mathematics (STEM) education. The International STEM Education Association (ISEA) seeks out individuals who have implemented STEM programs, provided professional development, encouraged others and have been instrumental in supporting integrated STEM education. The STEM Champion Awards are presented annually at the ISEA STEM Expo Conference.